One of the smallest but most successful countries in the world, the German-speaking microstate of Liechtenstein is known primarily for two things: its gorgeous alpine location and strong economy. Due to its size, Liechtenstein is culturally influenced by neighboring countries Austria and Switzerland. It is also quite similar to them geographically, with a mountainous landscape that draws scores of tourists for winter holidays. Outdoor enthusiasts have plenty to enjoy here year-round, with numerous hiking and biking trails. As the second-richest nation in the world with one of the lowest unemployment rates, Lichtenstein's charm nevertheless lies in the pride its citizens take in their country's independence and natural splendor. Vaduz: Trademarked by its stunning blue-tipped mountain peaks, Liechtenstein's alpine scenery stands in stark contrast to the modern architecture of its most well-known city and capital, Vaduz. The city may not be the biggest, but it is home to the current-day Prince of Liechtenstein's 12th-century palace, which sits perched hilltop amidst a sea of lush hills and valleys. The city also boasts several of the Prince's prized museums among the most popular Liechtenstein tourist attractions. History and architecture buffs alike won't want to miss Vaduz on a Liechtenstein holiday. 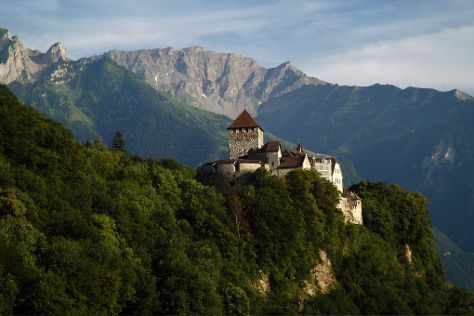 Vaduz Castle: Rounding out the height of Liechtenstein sightseeing is its arguably most famed attraction, Vaduz Castle. The medieval castle sits perched hillside and recounts the tales of the monarchy and nobility that have governed this small but mighty country. Burg Gutenberg: Unlike its famed counterpart, medieval Burg Gutenberg castle is uninhabited. The 12th-century palace is an important archeological excavation site and offers plenty in the way of scenic hikes, panoramic hilltop views, and tours of the grounds. Liechtenstein National Archives: A historical treasure in itself, the Liechtenstein National Museum is housed in a building dating back to 1438 that showcases 42 exhibit rooms full of historic artifacts that serve as testaments to the country's history, culture, and landscape. Postage Stamp Museum: Endlessly fascinating, the Postage Stamp Museum showcases Liechtenstein's philately as well as the history of the country's postal service. Exhibits include stamp printing machines, needle plates, postal worker uniforms, artwork, and a library. Liechtenstein Center: Liechtenstein Center represents the nation's modest tourist office, a valuable resource when it comes to learning more about the country's sites of historical and cultural significance. Hofkellerei (Wine Cellars) of the Prince of Liechtenstein: Drink like royalty at the Hofkellerei (Wine Cellars) of the Prince of Liechtenstein--the monarch's expansive vineyard and cellars. Quaint chalet houses sit against thick lush scenery overlooked by the sunny terraces of the Prince's nearby restaurant. Sareis Chairlift: Sought out by skiers and hikers alike, Sareis Chairlift offers year-round panoramic views of the slopes below from a breathtaking height of 2,000 m (6,562 ft) above sea level. Kunstmuseum Liechtenstein: Among Liechtenstein's modern architectural feats is Kunstmuseum Liechtenstein, a museum dedicated to the history of modern and contemporary art through the exhibition of sculptures and installments, which are housed in an interesting modern building. The ski-resort village of Malbun tops the list Liechtenstein places to visit if you're travelling with youngsters. The alpine region offers much in the way of family-friendly and year-round activities to fill up your Liechtenstein itinerary. Malbi Park offers special programs geared toward children that let them discover nature firsthand while adults relax and and enjoy their holiday too. Young guests will be well entertained, as there are a number of family-friendly attractions that top the list of Liechtenstein things to do. Kids can try their hand at archery, or tour the city on the trusty CityTrain, get lost in a maze, or dive into a swimming pool. Visitors of all ages will enjoy the skatepark, falconry center, and mini-golf course. It's easy to find family- and stroller-friendly hiking spots accompanied by barbeque areas. Or, explore the countryside by llama or alpaca on a guided tour. Malbi Park offers an outdoor playground, kindergarten classes, a petting zoo, sporting activities, high-ropes adventure courses, and plenty of games. During the winter season, take advantage of the pristine geography for winter sports. Visitors can opt to zoom down the mountain by toboggan, skis, or snowboard. Twirl around the open-air ice skating rink, or speed through laps on the indoor go-kart track. If you've never tried your hand at winter sports like skiing or snowboarding, take full advantage of the opportunity as part of your Liechtenstein vacation. The region is suited to beginners of winter sports, and the snow sports facilities are far less crowded than European sites. Plus area is modestly priced. You'll find many family-friendly mountain-side restaurants where children are welcomed and menus are extended to local and international cuisine to appease tastebuds of any age. Take advantage of the Museum and Adventure Pass for savings on admission to popular attractions. Save luggage space and rely on the rental services at the tourist office, where you can rent strollers, changing mats, baby baths, and all the essentials. You'll even find babysitting services available. With strong influences of neighboring countries Switzerland and Austria, Liechtenstein cuisine is very diverse--a tasty highlight on your Liechtenstein itinerary. The country's expansive dairy industry brings with it a high density of milk products in the typical cuisine, particularly cheese. Soups are also very popular along with greens, potatoes, and cabbage. Typical dishes include Käsknöpfle mit Apfelmus (a doughy pasta-style cheese dish served with applesauce), Rheintaler Ribelmais or 'Ribel (a polenta-like dish served in the Rhine Valley), and Schwartenmagen (pickled meat in jelly). Liechtenstein hosts a seasonal culinary festival during the autumn months in the village of Triesenberger where visitors can sample the region's culinary specialties and traditional dishes, including Öpfelchüachli, apple-flavored donuts. The country's favorable climate, influenced by warm winds, provides ideal conditions for winemaking; the country has more than 99 wineries producing over 20 fine wine varieties. Likewise, the country has two of its own breweries known for their specialty crafted beers. You'll find a local beer paired with Käsknöpfle on almost every menu. If it's retail therapy you're after, your Liechtenstein trip should include a visit to the capital city of Vaduz. Here you'll find plenty in the way of souvenirs like small trinkets branded with the nation's colors. The most popular items include flags, t-shirts, and cuckoo clocks. If you're after something a bit more authentic, visit the retail village between Vaduz and Balzers, home to retail clothing stores. If you collect passport stamps, be sure to visit the tourist office in Vaduz for an official stamp, as there are no border crossings where you can get passports stamped. Liechtenstein uses the Swiss franc (CHF), but many shops will also take euros, at a hefty exchange rate. Liechtenstein's roots date back to the Neolithic Period, when the land was first occupied. In the 15th century BCE the region was captured by the Romans, but later ruled by the Francs following the fall of the Roman Empire. With the arrival of German immigrants, the region became increasingly germanized. In 1712 the County of Vaduz was purchased by the Princes of Liechtenstein, along with the neighboring region of Schellenberg. The regions were amalgamated and established in the Holy Roman Empire in 1719. Today these two regions are easily distinguished as the Oberland (south) and Unterland (north). Liechtenstein's historical ties to both Austria and Switzerland are evident today in the culture of the nation, sure to be recognized during some Liechtenstein sightseeing. In 1806 Liechtenstein was declared a sovereign state, with close ties to Austria. Historically Liechtenstein has consistently remained neutral, and the nation takes great pride in the fact that they have never been involved with any military confrontation. Following World War I, economic hardship forced Liechtenstein into a monetary union with Switzerland, evidenced by its current use of the Swiss Franc (CHF). Since this union, Liechtenstein has experienced outstanding economic growth as a result of low taxes (which helped to draw many companies to the tiny country). Liechtenstein's prosperity has led to it being an important financial center. The people of Liechtenstein are very polite and nice, and they expect the same from tourists. Expect to hear a hello from a passing stranger, and be prepared to return the pleasantry. Though the country bears strong historical ties to Austria and Switzerland, it is considered insulting to proclaim Liechtenstein and its two neighboring countries one and the same. The country takes pride in its independence. The country also takes great pride in its monarch and system of government, so denouncement of the prince is ill-advised. As a traditional Catholic country, Sunday is revered as a day of rest; you'll find most shops will be closed on Sundays during your Liechtenstein vacation. Depending on the season, the holidays and festivals should give you ample Liechtenstein vacation ideas. Liechtensteiners pay reverence to Catholic holidays, but they also place particular significance on Mother's Day and Father's Day, revealing of the importance of family in Liechtenstein. The national holiday is held on August 15 every year, which consists of a large fair held in the capital on the lawn of the Prince's castle (revealing of the nation's importance of community) followed by a display of fireworks. Every December the capital city also hosts a Christmas market in the Old Town, complete with traditional snacks, mulled wine, mulled cider, and tea. Winemaking plays an important role in the traditions of the country, as does Bonfire Sunday--which showcases a bonfire on the Sunday after Ash Wednesday. At the end of the summer, the nation takes part in a ceremonial cattle drive, where cattle are elaborately decorated in traditional dress and cowbells and herded down from the grazing pastures high in the Alps. The country supports a continental climate, with cold cloudy winters and frequent rain and snow, which is why a Liechtenstein holiday is often sought out by tourists looking for a ski destination. The summers can be cool to warm, often cloudy as well as humid. Though there are no airports in Liechtenstein, it is close to Switzerland's Zurich airport. From there travellers most often take a train to Sargan or Buchs in Switzerland, and then catch a bus to Liechtenstein. Or you can rent a car at the airport and take the Autobahn directly into the country. Once you've arrived, you can rely on an efficient public transport network (LBA) to get around to the Liechtenstein tourist attractions. If you're feeling particularly adventurous, opt to travel by bicycle (many residents do); bikes are well-accommodated thanks to good road conditions and the proliferation of bike lanes. Though the national language of Liechtenstein is German, the language residents use every day is an Alemannic German dialect. The same dialect is used in German-speaking Switzerland, a southern region of Germany, and some parts of Austria. English is prevalent as a result of Liechtenstein tourism, but it's French and Latin that are taught as secondary and tertiary languages here. On your Liechtenstein vacation, it's important to know that tipping is not expected, however, it is common to tip 5 to 10 percent for good service.